As most of you know, RSCM is part of the group offering every TechStars company an additional $100K investment. When we first started talking to the TechStars folks, my immediate reaction was “kindred spirits”. This was also my reaction when we first spoke with Adeo Ressi of TheFunded and Founder Institute. Recently, I’ve been trying to put my finger on why I think of us all as similar. I think I’ve got it. We’re all meta-startups—startups that working to improve the process of launching startups. Up until a few years ago, founding a tech startup usually followed the same haphazard process it had for decades. Founders were pretty much on their own to thrash around and figure out how to test their innovations in the marketplace. It’s how I did my first startup in 1993. It’s how I did my last startup in 2004. Same with Dave Lambert, my partner at RSCM, with his first startup in 1993 and his last in 2003. It’s what we saw all our entrepreneurial friends do. This “process” has a high bar for founders to clear and a low success rate, limiting innovation. Now, the Internet increased the speed at which the haphazard process can execute. So the situation has modestly improved over the last 15 years. But what we want is fundamental improvement. What we want is the equivalent of an Amazon, Google, or Facebook to change the rules of the startup game. High-volume, high-speed incubators like Y Combinator (2005), TechStars (2006), and Founder Institute (2009) are a great leap forward in discovering a more systematic startup process. They’re paving the way toward more startups, higher success rates, and dramatically more innovation. Many of the improvements they pioneer should diffuse out into startup community. So they’ll enable startup in general, not just the ones in their programs, to launch more smoothly. Our role in this revolution is eliminating the huge seed stage funding roadblock. Now, with all the press about angels and superangels funding startups in Silicon Valley and New York, you may think getting seed funding is easy. But I’ve run the numbers. Seed funding is actually down 40% from it’s peak in 2005. I’m pretty sure the cost of doing a startup hasn’t dropped 40%. And I’m quite sure that the number of quality founding teams hasn’t dropped 40%. The seed stage generates very high returns. There’s a good dataset of angel investments from the Kauffman Foundation, mostly from 1998 and later. Depending on your selection criteria, returns are at least 30% and possibly over 40%. Calculations here and here. You can’t pick winners at the seed stage. This is precisely the kind of prediction tasks where “gut feel” or “expert judgement” performs poorly. Human predictions almost never beat even a simple checklist. Review of evidence here. Interviewing founding teams is a poor indicator of their ability. There’s been an incredible amount of research trying to figure out how to predict who will be good at which job tasks. Unstructured interviews are the worst predictor. Highly structured interviews or matching of past experience to current requirements does better. Review of evidence here. Grand slams aren’t necessary to achieve high returns. You don’t have to do anything special to make sure you get the “best” deals. First, nobody has shown they can identify such startups before they release a product. Second, even if all you get is base hits, you’ll still have returns of about 30%. Calculation here. The conclusion from this evidence is pretty straightforward. But it implies a seed-stage funding approach very different what we see today. A classic opportunity for a startup (or meta-startup). If the seed stage has high average returns but you can’t pick specific winners, basic financial theory says to use a portfolio approach. You want enough investments to have a reasonably high confidence of achieving the average return. I’ve done the calculation, and my conclusion is that you want to build a portfolio of hundreds of seed-stage investments. That may sound like an unreasonable number. But if you don’t have to spend hours doing multiple interviews of every founding team, you can dramatically streamline the process. In fact, we have a demo version of our software that can produce a pre-money valuation from an online application in a few seconds [Edit 3/16/2013: we took down the Web app in Jan 2013 because it wasn’t getting enough hits anymore to justify maintaining it. We continue to use the algorithm internally as a spreadsheet app]. After that, it’s a matter of back-office automation. Luckily, previous generations of startups have made such automation pretty easy. Just think about how these conclusions should lead to a much better environment for seed stage startups. Investors will actually decrease risk by making more investments. The same process that allows them to efficiently building a large portfolio means they can give a much faster response to entrepreneurs. Lower transaction costs mean startups will see more of the money investors put on the table. As always, innovation is a win-win. And in this case, we’re innovating in the process of funding innovation. A meta-innovation, if you will. Even better, the average person on the street wins too. 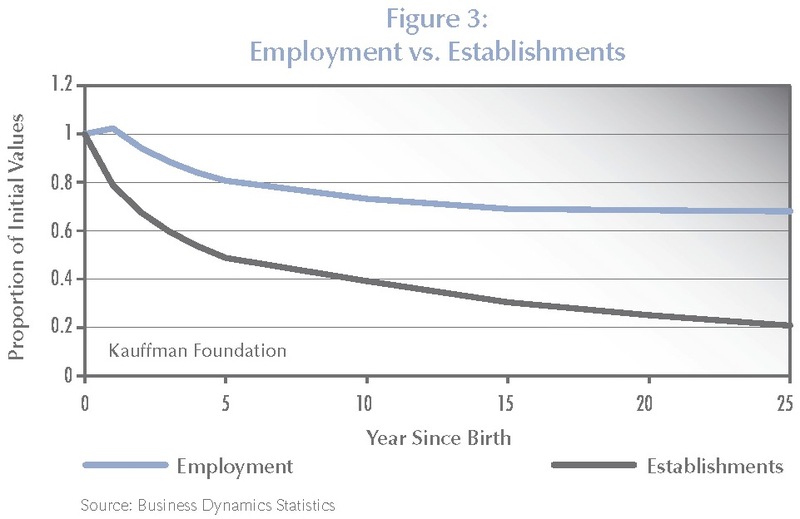 Because, as I’ve shown before here and here, increasing the rate of startup formation increases the rate of economic growth. So if meta-startups can permanently increase this rate, the returns to society as a whole will quickly compound. The only firms that create jobs on average are brand new ones. So yes, you can save the world with startups.